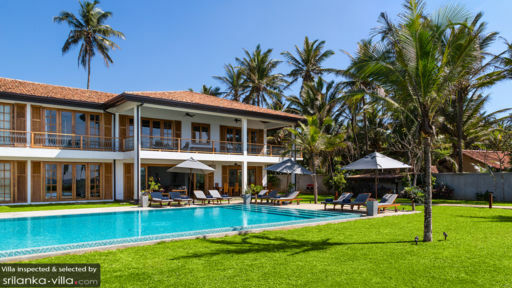 The Boat House is a beautifully appointed holiday home set along South Sri Lanka, in the serene market town of Dikwella. 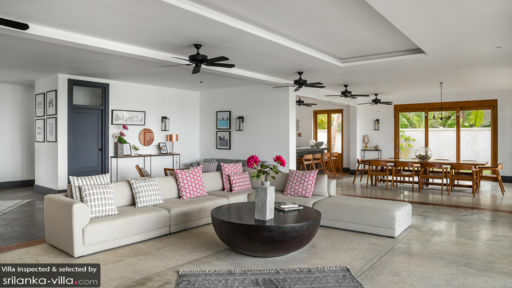 With four bedrooms, it’s ideal for family and travelling parties of 10, and the villa’s prime coastal location makes it the perfect option for beach lovers. 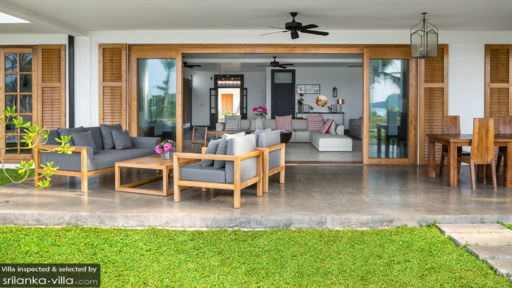 Featuring living spaces that are bright and airy, bedrooms with incredible sea vistas and interiors that are kept cool with sea breezes through the day, The Boat House is the sort of vacation home that every holidaymaker dreams of. When rented along with the neighbouring villa, The Lookout, the entire complex can accommodate up to 22 guests. Wedding celebrations, parties and events are accommodated if both villas are booked. The expansive garden and turquoise pool are all yours at The Boat House. A sun-soaked deck framing the pool comes outfitted with patio umbrellas and recliners, inviting vacationers to sit back, relax and soak up the tropical vibes and ocean breezes. The villa offers direct beach access, placing beach lovers a stone’s throw away from the golden shores. With housekeeping and private chef services, you won’t have to lift a single finger throughout your holiday. This leaves you with ample time to enjoy all the luxuries that The Boat House has to offer - from lounging in the indoor-outdoor living area, to enjoying an al fresco meal at the veranda or taking a soothing soak in the bath tub. The open plan living area is wonderfully expansive, and contains an indoor lounge, dining area and open kitchen with breakfast bar. The vibes here are inviting and cosy, with neutral colours, wooden furnishings and elegant ornaments filling up the interior. Prince, the in-house butler at The Boat House will assist with all your vacation needs - from day trip and transport arrangements, to planning out a private dining experience in the villa. External laundry services available at additional cost. Enjoy the relaxed beach vibes and exceptional surf of Dikwella. Hiriketiya Bay, a popular surf spot is just a five minutes’ ride by tuk tuk from your villa. Planning for day trips in south Sri Lanka is a breeze thanks to its variety of nature and wildlife attractions. Stop by the Wevurukannala Vihara (10 minutes’ drive) in your drive about town to admire its paintings and statues. Blow Hole Hummanaya, located 15 minutes’ drive away offers a magical sight from the months of May till October. Mirissa Harbour (an hour’s drive) and Dondra Point (26 minutes’ drive) are popular whale watching destinations. Turtle Watch Rekawa (43 minutes’ drive) is a must-see for animal lovers. If you’re looking to spend quality time with family in an unhurried, relaxed manner, we recommend canoeing or strolling around the scenic Tangalle Lagoon (26 minutes’ drive). We loved everything about staying at the Boat House - from the super-friendly welcome from Prince to the wonderful pool. The house is perfect for a family holiday - lovely open plan sitting room/dining room opening onto the garden and great spacious bedrooms. We loved being right on the beach and the close proximity of surfing. The market in Dikwella on Saturdays is not to be missed!! The best thing however was the service and the wonderful way that we were looked after by Prince, Mohammed and Premil - they really made our holiday so relaxing and comfortable and were always smiling! We didn't need to worry about anything and were able to unwind completely. Thank you to everyone at The Boat House for making our stay so amazing. The food was insanely good, which is not easy with all our dietary requirements which were catered for. The view of the beach is stunning and the accommodation really needs to be seen to be believed. The pool is so tranquil and great for unwinding with a book and a coconut. 5 minutes walk to the amazing Hiriketiya beach which has 2 excellent breaks for beginners and advanced surfers. Even when there were flat conditions there it was a 10 minute tuk tuk ride to a good break. Can't wait to visit again! We had an amazing time at the Boat House, really quite a special place. Firstly the location, walk across the pool area, down a few steps and you’re on the beach, a huge sandy bay, the sea was the perfect temperature for swimming and very clear water. The next bay along is a super cute coconut lined, a great surfing spot and a few other great surf spots dotted around the coast nearby. Good location for day trips to Galle, Mirissa, Uda Walawe National Park etc. Local shops a walk away in Dikwella, the house is in town but away from the main street so all you can hear is the sound of the sea, very restful. The house itself has been finished to a very, very high standard. Really spacious, big bedrooms each with their own character and huge living/kitchen/outdoor areas. The finishes are really impressive, very luxurious, feels like no expense has been spared, quite unlike anywhere I’ve stayed before. The staff were super nice, Prince who headed up the front of house and Mohamed were both very helpful and attentive and really nice people. The chef was incredible, we ate some amazing food and the local seafood in particular prepared by his skilled hands was to die for. Wish we had a few more days at the Boat House but hopefully we’ll be back again!